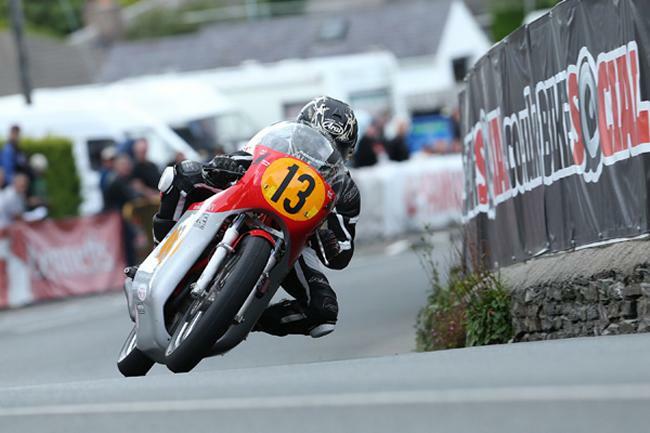 Yorkshire's Dean Harrison, riding the Black Eagle Racing MV Agusta, won an eventful Bennetts 500cc race, the opening race of the 2015 Classic TT meeting. Harrison went in front at Ramsey on the opening lap and eventually finished 26 seconds ahead of Ian Lougher on the Giovanni Cabassi Paton with Harrison's teammate Lee Johnston taking the final podium place. 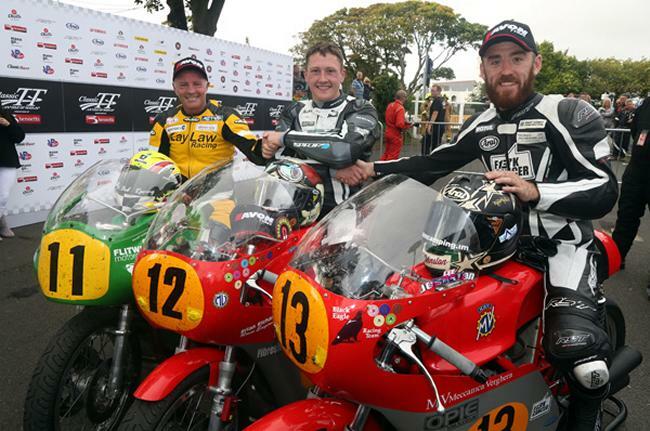 With the Patons of John McGuinness, Ryan Farquhar and Lougher the fastest three qualifiers for the Bennetts 500cc Classic TT Race, the illustrious trio were the clear pre-race favourites. However, the old adage that 'to finish first you first have to finish' has never proved more appropriate with the Team Winfield pair retiring on the opening lap in Ramsey. Welshman Lougher's challenge was also effectively over after he picked up a thirty second pit penalty, as he did in the same race in 2014, after a refuelling pit stop at the end of the first lap, although a dramatic charge from the Flitwick Motorcycles rider through the field saw him move up from 8th to take the runner up spot. McGuinness and Farquhar were the first two to Glen Helen on the opening lap with Dean Harrison splitting the Patons with Lougher in fourth. However it was clear that the Team Winfield pair were both experiencing problems. McGuinness had dropped to fifth by Ballaugh and retired at Parliament Square where he was joined by Farquhar leaving Dean Harrison in front at Ramsey from Lougher with Lee Johnston third and Michael Dunlop and Dan Cooper completing the top five. 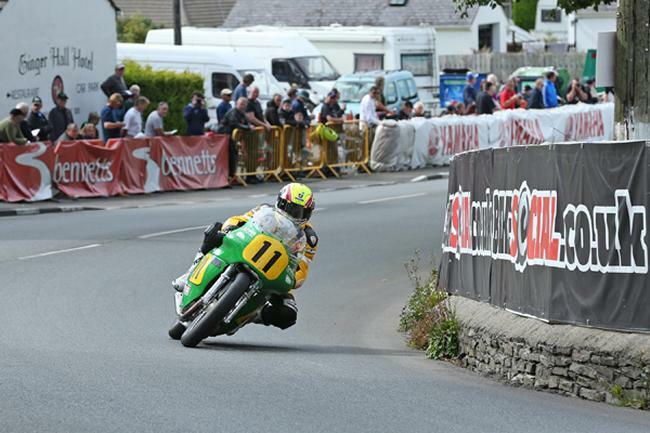 Harrison's opening lap of 110.463 gave him a 15 second from Lougher at the end of the opening lap and with Lougher's pit stop and penalty the lead was extended to well over a minute from the Welshman by Glen Helen on the second lap. Harrison's teammate Lee Johnston was his closest challenger and at the end of the second lap he was18 seconds behind with Michael Dunlop in third. Lougher had moved up to fourth with Danny Webb completing the top five. The pre-race debate centred around refuelling with the single cylinders of the likes of Michael Dunlop and Danny Webb on the '62 Molnar Manx Nortons, running straight through while the twins, triples and fours were obliged to pit on the 151 mile race but the MV's and Lougher's Paton proved too strong on the road and the pit stop didn't dramatically influence the race, apart from Lougher's penalty. All eyes were at the first timing point at Glen Helen on the third lap, after Harrison and Johnston came into the pits and while Harrison remained in front albeit only three seconds ahead of Dunlop, Johnston had dropped to third, fourteen seconds behind Dunlop with Lougher now only four seconds behind Johnston and Danny Webb completing the top five. Lougher moved up into second place at the end of the third lap but Harrison's lead was up to 25 seconds and the Yorkshireman duly brought the MV home for a dominant win in 108.855 (01:23.11.161) from Lougher who recorded 108.273 (1:23.37.965) with Lee Johnston taking the final podium place with107.972 (01:23.51.978). Michael Dunlop was reported as retired at the Mountain Box on the last lap leaving Jamie Coward on the Craven Honda to take fourth place. Chris Swallow, riding D.G Kenah Norton completed the top five with Dave Madsen Mygdal, who finished seventh, having the honour of being the first privateer home. South African Johannes Van de Pol came off at Tower Bends and was taken by airmed to Nobles Hospital where he was reported to have leg fractures. Away from today's race the attention was focused on Bruce Anstey's F1 qualifying lap earlier in the day when the flying Kiwi scorched round the Mountain Course. 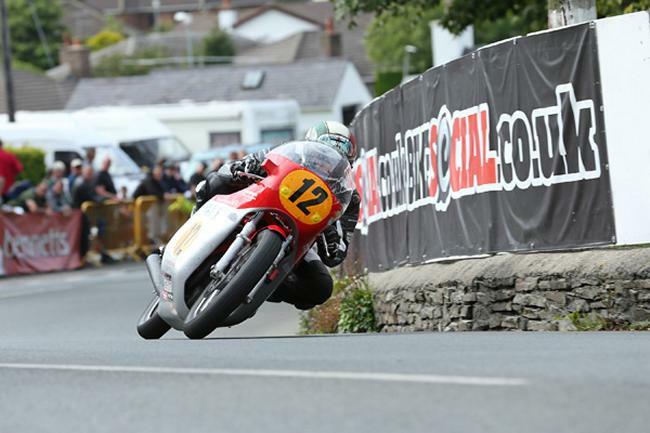 Transponder issues meant that he was awarded a time of 122.546 (18.23) for both laps but with the second a flying lap, speculation was that he had exceeded the Classic TT lap record of 123.894mph that he set last year. Regardless, the kiwi is clearly set fair for Monday's Motorsport Merchandise F1 Race although Peter Hickman with a 123.364 (18.21.037) in the same session, topped the overall F1 qualifying leader board and will undoubtedly challenge the Kiwi for the race win as will fellow Kawasaki mounted Dean Harrison and Team Classic Suzuki pair Michael Dunlop and Lee Johnston. In the 350cc qualifying session ahead of Monday's Okells 350cc race, Michael Rutter on the Ripley Land Racing Honda (100.665) and Dan Cooper on the Team Molnar Manx Norton (99.364) both clocked their fastest laps of the week to finish second and third overall on the qualifying leaderboard but the pair were behind Lee Johnston's time (102.321/22:07.468) from Thursday's session.